Three different body and leg designs for each of the Light, Medium, and Heavy Mechs- Now with Humanoid Mech body designs! New leg designs to give more dramatic poses and to ease construction. Twenty-two different weapon and equipment options. Unified weapon slot sizing allowing interchanging weapons between the different Mech sizes. New Multi-slot Hardpoints to allow mounting multiple weapons in different configurations at each of the Mech's hardpoints. Four standard colors including: Blue, Green, Gray, and Tan. 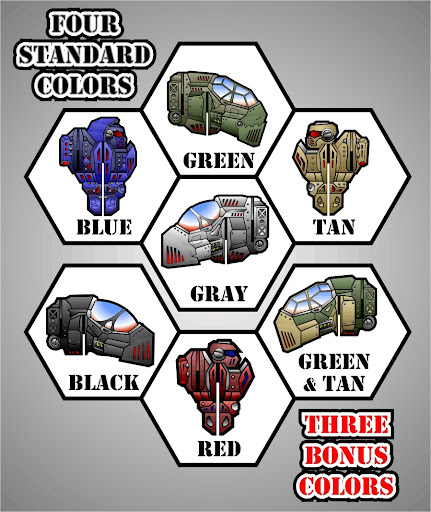 Three bonus experimental colors including: Black, Red, and Green & Tan. This set now includes an additional version of uncolored miniatures to create your own designs! 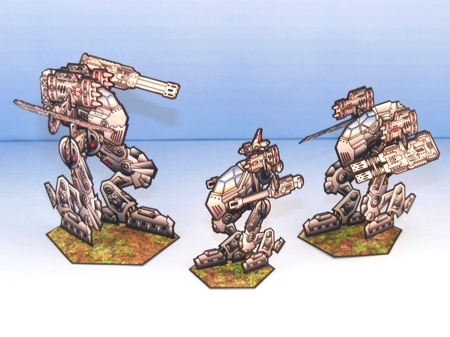 These miniatures match the scale of the original Armor Grid: Mech Attack! 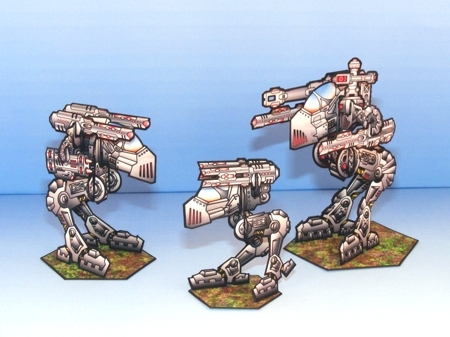 miniatures, so they can easily fight side by side with your current army! All Armor Grid Miniatures and paper figures are rendered in 300dpi for high quality printing. Designed with complete front and back images to more closely represent more traditional gaming miniatures, these miniatures are provided with easy to follow directions and multiple basing options. 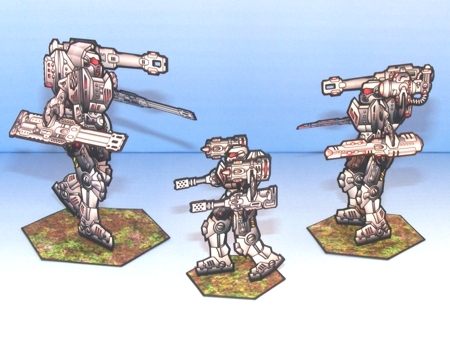 Download FREE Hex Grid: Print Bases for placing your Mechs in any terrain you wish. Adobe Acrobat Reader 7.0 or higher is required to use this product. 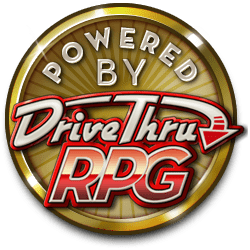 Check out www.armorgridgames.com for more information. This title was added to our catalog on September 14, 2011.